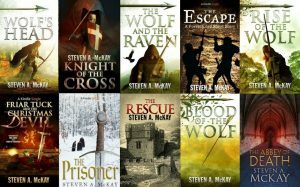 Today I am delighted to welcome Steven A McKay to my site for a natter. 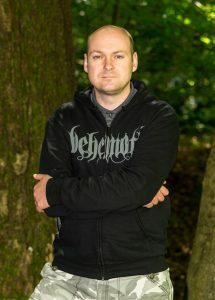 A fellow lover of myths, legends, and things historical; Steven is one of the most successful self-published authors in the UK. He also likes Robin of Sherwood…Enough said!! So why not go and grab a drink and join us for a quick chat? When did you first become interested in the Robin Hood legends? Honestly, it was only when I decided to write a book about him. I have always been interested in King Arthur and I wanted to write something with a similar character and similar setting. You know: the green fields and woods of Britain with hard men drinking and fighting and loving! Bernard Cornwell had already done King Arthur so I had to look elsewhere and Robin Hood was the obvious choice. When I started researching the character I realised he, and the whole legend around him, was much richer and more interesting than I’d ever thought. It really made Wolf’s Head, and the following books, a joy to write. First and foremost I had to learn about the legend. The elements that everyone knows, such as the characters and the golden arrow Robin wins in the Sheriff of Nottingham’s archery tournament. Then I had to really find out about my period (14th century in this case) because to write about a certain time you need to know the tiniest details. 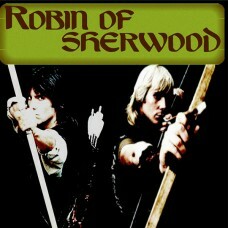 Most of my research was done from books or the internet but I bought the entire Robin of Sherwood TV series on DVD and had a blast watching them. The friendship displayed by those characters, and even the actors portraying them, was a big influence on my novels. I was very lucky to have Phil Rose, who played Friar Tuck in that show, write a foreword for one of my novellas and even read it out for the Audible version in that wonderful voice of his! Well, as I mentioned, most people already know many of the elements of the Robin Hood legend so for those books I had certain things that had to happen. But I was able to put my own spin on the whole thing and, in general, although I have an idea for how to start and end a book, I don’t plan very far ahead. Normally I just write a few scenes and see where it takes me. I think some people might work best by planning everything out in advance but, to me, letting a book develop organically leads to a much more dynamic, interesting read. I mean, if even the writer doesn’t know what’s coming next how can it be predictable? Of course, that doesn’t stop people leaving reviews on Amazon saying they always knew what was coming next which is really weird since I didn’t even know myself when I was writing the books…! You are one of the most successful self published writers I’ve come across. What would be your top three tips for a self published writer? I think, first and foremost, you need a decent product that can stand up against the big guns in the publishing world. That means having a decent text that isn’t littered with errors, an exciting blurb, and a good cover image with – and this is hugely important for me – decent fonts. So many times I see good cover art on self-published books but the fonts are the standard ones that come free with Paint or whatever and it just looks amateurish. Hire a cover designer and an editor if you can afford it. Second, even before you publish a book, try and find people to read it. Send them advance copies and ask them to post reviews on Amazon so as soon as it hits the virtual shelves potential buyers can find out what others thought of it. Finally, if you’re going to run promotions such as the KDP Countdown deals, you need to tell people! There’s no point in making your book 99p for a week then complaining no one bought it – you need to tell them it’s on sale and that means using paid ads. Places like Bookbub, Freebooksy, Kindle Nation Daily etc are all worth using. I occasionally post tips about self-publishing on my website so do take a look if you’re interested. Tell us about your latest book. What excites you the most about it? Well, I’ve finished my Robin Hood books now – the final novella (The Abbey of Death) has actually found a publisher which is really exciting for me but it means I’ve been able to start work on an entirely new series. This one is about a warrior-druid in post-Roman Britain and I am loving writing it. It was nice having readymade characters like Friar Tuck and Little John who I simply needed to flesh out and bring to life but this time around I’m coming up with my own creations and its strangely liberating! The setting is really interesting to research since not much is known about 5th century Britain, especially Scotland, but most exciting for me is my main character. A six foot six, handsome, muscular druid who fights like a hero from legend, on a quest that will take him all around this great island meeting all sorts of weird and wonderful folk along the way…Honestly, it’s just huge fun to write, I’m so lucky to have a job like this. Obviously my family but for the sake of making this a little more interesting I’ll come up with a different answer. Besides, now I think about it, why would I want to strand my wife and kids on an island just to make my own loin-cloth clad, bearded, pitiful existence more bearable?! 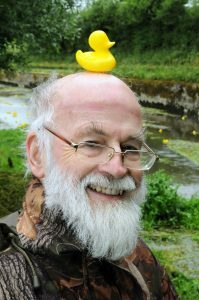 So…we’d need some laughter out there in the middle of nowhere and I reckon Sir Terry Pratchett would have been the ideal companion. I loved his Discworld books and it would have been great to spend time with him talking about writing and just general silliness. 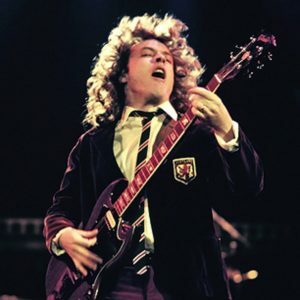 Next we’d want some music to keep our spirits up so I’d probably pick fellow Glaswegian Angus Young of AC/DC. I’m assuming he’d have rescued a battered old acoustic guitar from the shipwreck so he’d be able to keep us entertained with folk renditions of “Thunderstruck” and “Hell or High Water”. Maybe I’d get a chance to play the guitar myself although if it came to a fight about it he’d win, even if he is just five inches tall. Finally, I’d choose my own new character, the warrior-druid Bellicus. Not only would he protect the rest of us from wild animals with his martial prowess, but he’s a trained musician and spent many years learning the skills of a druid. He’d heal our wounds, talk for hours about the gods and their foibles, show me and Angus a new chord or two on the shared guitar, and give us the last rites if one of us died in a freak gardening accident. Actually it sounds like a pretty fun place – where do I sign up? Steven A. McKay was born in Scotland in 1977. His first book, “Wolf’s Head”, came out in 2013 and was an Amazon UK top 20 bestseller. “Blood of the Wolf” is the fourth and final book in the Forest Lord series which has over 95,000 sales so far. Steven is currently working on a brand new tale set in post-Roman Britain. Many thanks for taking the time out to join us today Steven. I’m very much looking forward to reading your Robin Hood stories (my Kindle is loaded and ready to go), and indeed your post Roman stories in the near future. 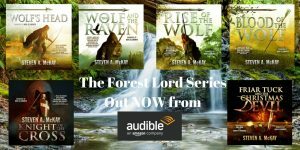 A really good interview thank you, i am on the 3rd book of the forest lord series and although it is essentially about Robing Hood and all the main characters are their and yes they are true to the legend, however, i would urge anyone who is thinking about reading these books please don’t be put off by the subject matter, the story is told in a completely different way and the reader will, in my opinion not be disapointed.